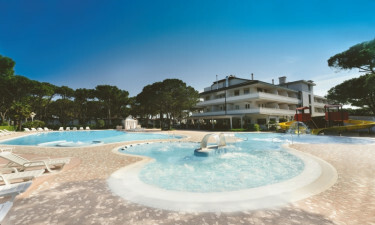 Set among fragrant pine trees on the enchanting Adriatic Coast, Camping Residence Village is a luxury camping site that has been designed with the needs of families firmly in mind. 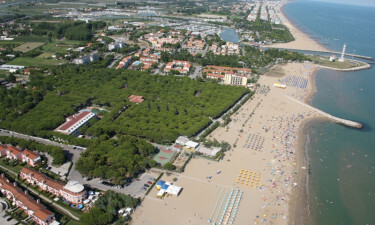 While everything that is needed to experience the camping holiday of a lifetime is provided on the site, the vibrant city of Venice is also just a short distance away and makes the perfect day trip destination. Contact our Lux-Camp representatives to learn more. Why Should I Camp at Camping Residence Village? Camping Residence Village has its own private beach where families can have fun playing in the sand and soaking up the sun. This Lux-Camp also features a lagoon pool complex that boasts a large pool with a Jacuzzi area and water slides that the kids are sure to enjoy, as well as a shallow pool where toddlers can splash around. Guests will be able to create tasty meals for the family to enjoy in their mobile home or on the beach, using fresh produce such as bread, cheese and meat that is supplied at the on-site supermarket.